Polybutene-1 satisfies the demands of the hot and cold pressurised water pipe market with the right balance of properties, including excellent flexibility combined with superior resistance to stress over long periods of time at high temperatures. As a result, PB-1 piping systems are easy to work with, economical to install and deliver long-term performance quality in commercial, domestic and industrial piping applications. Flexibility is an advantage offered by a number of plastics in comparison with metals, however Polybutene-1 is clearly the plastic material of choice as illustrated in the following table, where typical flexural elasticity values of various polyolefin pipe materials are compared. The advantages of flexibility during the installation and service of Polybutene-1 piping systems are described in detail on this website. Obviously, the easier a pipe is to manipulate on site and in tight situations, the lower the installation time should be. In this respect, the ease of cabling through drilled holes and threading through confined spaces, combined with long pipe runs and therefore a reduction in the number of fittings required, are all factors which contribute to the speed of installation and associated reduction in labour costs. Although Polybutene-1 pipe is easily flexed, care should be taken not to bend the pipe to the point of 'kinking'. 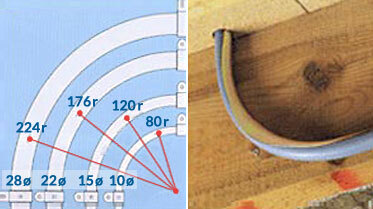 In this respect, a minimum bending radius of 8 times the pipe diameter is recommended. The figure (above right) illustrates the recommended minimum bending radii for various Polybutene-1 pipe diameters. The resistance of pipes to deformation and burst is determined by testing to international and national standards. The test results are then used to calculate the maximum permitted hoop stress for hot water transportation according to a defined set of conditions, referred to as temperature classes. These temperature classes are compiled to reflect the likely cross-section of service conditions for a 50-hour period for a range of different heating and water supply applications. The internationally accepted temperature classes are stipulated in ISO Standard 10508, and referred to in other systems standards for plastic piping systems. These calculations indicate that the required wall thickness of Polybutene-1 pipes could be less than the other candidate materials for equivalent stress resistance performance. However, the calculation of wall thickness depends on other additional standardised requirements with the result that with pipe diameters of less than 16mm, all polyolefin pipes must comply to a minimum fixed thickness standard defined for a specific material. Consequently the performance benefit of Polybutene-1 pipes leads to an increase in the design factor of +35% in comparison with cross-linked polyethylene and +50% when compared with PE-RT, rather than in corresponding material savings. The Polybutene-1 performance benefit offers +35% design factor vs. cross-linked Polyethylene and +50% vs. Polyethylene-RT. For pipe diameters greater than 16mm however, it is allowable to calculate pipe thicknesses according to standardised performance criteria where the advantages of using Polybutene-1 can be realised in terms of lower pipe weight and hence less raw material consumption and cost. The following table illustrates the benefits of using Polybutene-1 in comparison with competitive materials in a 40mm diameter pipe for a 50-year life expectancy at 70°C continuous operating temperature including design factors. With its high resistance to creep over a wide temperature range coupled with low thermal expansion, Polybutene-1 has a particularly good fit with the industry requirements for pressure pipes use in domestic, commercial and industrial hot and cold water systems. The internal pressure resistance of Polybutene-1 pipes is presented in ISO 12230 - Polybutene (PB) pipes: Effect of time and temperature on expected strength. This provides the benchmark standard for evaluating the suitability of all Polybutene-1 materials. 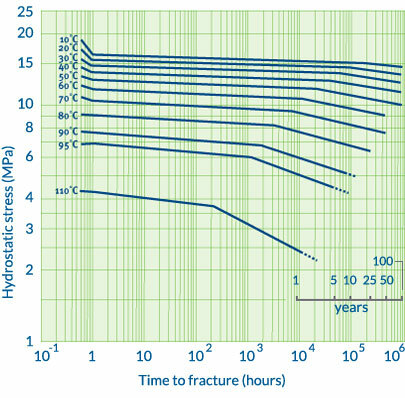 This standard provides both a graph of reference lines (right) and a table of hoop stress values (below), which together represent the criteria of acceptability specified in a number of other standards. The standard ISO 10508 - Thermoplastic pipes and fittings for hot and cold water systems - in combination with ISO 12230 defines the performance requirements in applications for which Polybutene-1 pipes can be used in terms of the following 'Classification of Service' conditions. ISO 10508 Thermoplastic Pipe Application Classes. The most commonly used standard for determining the compliance of the performance of Polybutene-1 grades (with reference to ISO 12230) is ISO 9080 (EN): Plastics piping and ducting systems - Determination of long-term hydrostatic strength of thermoplastics materials in pipe form by extrapolation. This standard procedure is usually carried out by accredited independent pipe testing institutes to verify the performance of all thermoplastic hot and cold water pipe materials. The mechanical noises which accompany the heating and cooling cycles of heating pipe systems made from metals are almost eliminated when plastic piping systems are used. Plastic pipes reduce and muffle the transmission of both mechanical noise and 'water hammer' effects. The low elastic modulus of PB-1, plus reduced wall thickness gives a low surge pressure for a given pipe OD and pressure rating. For sound conduction through solids, the sound insulation and absorption of the material are important criteria and this is a function of the density and elasticity of the material. The acoustic properties of plastics, when plotted over broad ranges of frequencies and temperature, are usually determined by the glass transition temperatures of the particular plastic material. At temperatures above the glass transition temperature, Tg, the sound speed is greatly reduced and sound absorption is greatly increased. The Tg of Polybutene-1 homopolymers is -18°C. The typical service temperature of a heating or potable water installation is well above this Tg so sound transmission is significantly reduced. With metals such as copper, no glass transition exists so sound transmission remains high, even at temperatures approaching the melting point of the material. For materials generally, it is observed that the higher the density, the higher the sound speed. The data presented in the table below clearly shows this relationship for a selection of common plumbing materials. Obviously, design of the installation is critical in ensuring the quiet operation of a plumbing system. To achieve the best results, due consideration should be given to the choice of pipe and fitting materials and the optimum layout of the piping system relative to the building's construction. A column of moving water within a pipeline contains stored kinetic energy arising from its mass and velocity. Since water is essentially incompressible, this energy cannot be absorbed when a valve is suddenly closed. 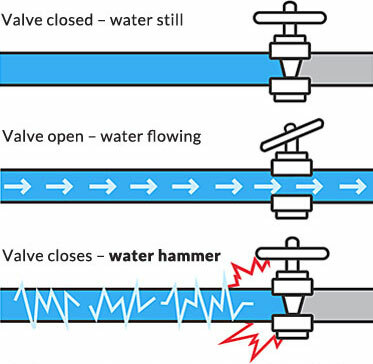 The result is a high instantaneous pressure surge normally referred to as 'Water Hammer'. Corrosion of metals and metal components in heating and water supply installations will occur due to the presence of free oxygen in the water. Oxygen will almost always be present in any system as it can enter through a number of points, such as open header tanks, valves, threaded joints and pumps, and also through gas permeable materials. In closed loop heating systems which are not continually supplied with hot water, minimisation of oxygen ingress through the pipe wall will significantly reduce the occurrence of corrosion. For this reason, oxygen tight Polybutene-1 barrier pipe has been developed. Barrier pipe consists of 3 or 5 concentric co-extruded layers of material which are combined into one integral pipe wall. In a 3-layer structure, Polybutene-1 constitutes the inner layer and ethylene vinyl alcohol copolymer (EVOH) the outer layer. The central layer is an adhesive material which is compatible with both the inner and outer functional materials to form an integral structure. In closed loop heating systems, PB-1 barrier pipe was developed to minimise oxygen ingress through the pipe wall. 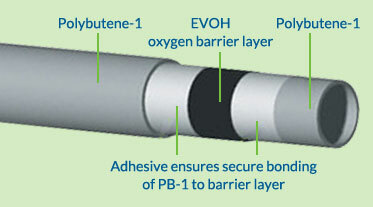 EVOH is the oxygen barrier material that has extremely low oxygen permeability characteristics. To further improve the oxygen barrier performance, a 5-layer pipe structure has been developed. In this case, the inner and outer layers are PB-1 and the centre layer is EVOH. On either side of the EVOH are 'adhesive tie' layers. The advantages of the 5-layer structure are that the EVOH layer is protected from both physical and atmospheric effects, and hence provides a superior oxygen barrier performance per unit weight of EVOH. Small amounts of oxygen will enter all heating water circuits whatever the type of pipe used, and therefore to protect the system against the effects of corrosion, inhibitors are added to the circulating water. Legionella is a bacteria occasionally naturally present in water distribution networks, and presents a potential danger to the health of the users of these installations. The factors to combat to prevent the reproduction of this bacteria in piping systems in buildings are its reproduction temperature and the formation of a biofilm as a substrate for the feeding and colonisation of the bacteria. The reproduction temperature of Legionella is between 20° and 50ºC, so water temperatures within this range must be avoided. On the other hand, the formation of a biofilm is aided by the accumulation of stagnant water, the temperature within the aforementioned range, the roughness of the piping and the possible corrosion of its metal. The reproduction temperature of Legionella is between 20 and 50ºC, so water temperatures within this range must be avoided. The annihilation temperature of Legionella is established at 70ºC, and this is why thermal disinfection treatments require fluid to be heated to this temperature. The international standards for production consider this working temperature for this application, where Class 2 is defined as applicable. The best choice of material for this problem is Polybutene-1, and with good design and appropriate maintenance of the installation, potential problems of Legionella can be avoided. PB piping, due to its low roughness, the lack of metal corrosion, and its optimum resistance at 70ºC (annihilation temperature of the bacteria) is ideal for preventing Legionella problems. They are, in addition, suitable for annual chemical disinfection treatments (30 ppm of Cl at 30ºC, 6 bar and for 2 hours), according to tests performed by the manufacturer of the raw material, LyondellBasell in independent laboratories. Polybutene, like other polyolefins, is highly resistant to solvents and chemical products, with a few exceptions. PB-1 can however be attacked by non-polar organic solvents, such as benzene, toluene, carbon chloride, etc. Consult your PB-1 piping system supplier for more information on specific contact. Chlorine is a harsh oxidising agent for both Polybutene and other polyolefins. The percentages that are found in the drinking water networks (< 1ppm) are not harmful, nor are the annual treatments performed to prevent the apparition of Legionella bacteria. The ultraviolet rays in sunlight can cause or accelerate the deterioration of the material. The product must be shielded from direct sunlight, in storage as well as in its final use. In the case of outdoor use, it should be sheathed or painted to protect it. If it is painted, it is preferable to use emulsion paints (water-based) to paint Polybutene-1. Oil-based lacquer paints can be used with a primer. Do not use cellulose-based paints, paint strippers or solvents. Before painting, ensure the surfaces are clean, dry and free of grease. PB-1 is a very suitable material for cooling and air conditioning. Polybutene-1 is a very suitable material for cooling and air conditioning. It maintains its flexibility better than other materials at temperatures below zero and resists the families of glycols used as antifreeze. The tests performed in our laboratories indicate optimum behaviour and resistance in these conditions. The glass transition temperature is -16ºC, with pressure tests performed at temperatures of up to -40ºC. Its flexibility means it can withstand the freezing of the water carried without rupture, unlike more rigid materials that break in the event of freezes.